Using silver plated textured open jump rings, learn byzantine—a fundamental chain maille weave. 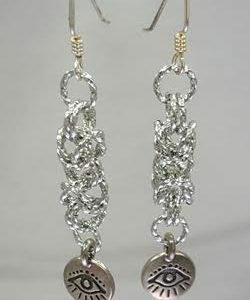 Make a short length of byzantine, add a pewter charm and a sterling ear wire, and voila, a lovely dangle earring. Learn the basics of byzantine chain maille to make a bracelet. 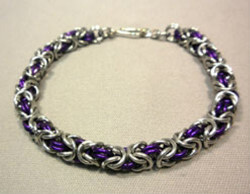 Chain maille is a technique of taking individual open jump rings and putting them together to form a mesh or chain. Proper tool handling and opening and closing of rings will be emphasized. No experience necessary. $30 instructor fee/$38 materials fee.